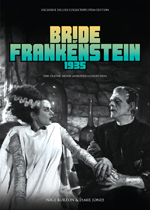 Classic Monsters of the Movies – just like horror magazines used to be! 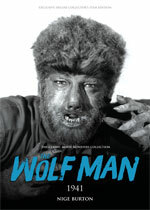 The world of horror movie magazines has never been more exciting! 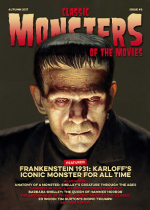 Classic Monsters of the Movies is the ultimate bi-monthly publication for all fans of horror movies, peering deep into the dark and cobwebbed archives of all your favourite films to unearth stacks of rare stills and information on the beloved classics and their casts and crew. 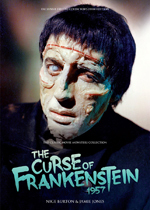 Penned by leading horror film historians such as Nige Burton, Jamie Jones, Alex Hopkins and Bruce G Hallenbeck, edited by horror movie maestro Nige Burton, and featuring unique cover artwork by acclaimed artists Daniel Horne and Ron Whittaker, Classic Monsters of the Movies brings the classic horror films of yesteryear back to reanimation in all their glory. Ours is a broad church indeed. 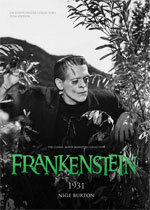 From timeless silent masterpieces such as Nosferatu, The Phantom of the Opera and The Man Who Laughs; through the Universal golden age of Dracula, Frankenstein, The Mummy, The Invisible Man and The Wolf Man; spanning the 50s sci-fi years of the Creature from the Black Lagoon and the Metaluna Mutant of This Island Earth; into the age of colour with Hammer’s grisly blood-soaked classics; and into the modern era of slasher suburbia with Michael Myers, Jason Voorhees and Freddy Krueger – Classic Monsters of the Movies is packed with all the monstery goodness we’ve loved through the decades. 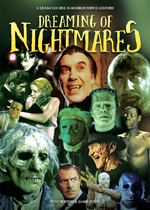 So if you love your classic horror films, and haven’t yet become acquainted with Classic Monsters of the Movies, it’s high time you found out what all the fuss is about. 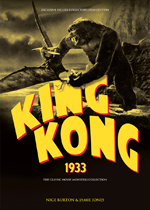 Since its launch in the late summer of 2015, it has become beloved the world over, with a huge base of readers and subscribers in the UK, the USA, Canada, Europe, Asia and Oceania. 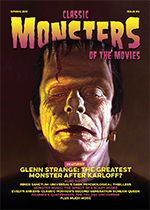 With gloss laminated covers, 68 pages of full colour, silk finish pages and no more than one side of advertising in each sumptuous, perfect-square-bound issue, you’ll soon discover for yourself exactly why monster kids across the globe have fallen head over heels for Classic Monsters of the Movies. 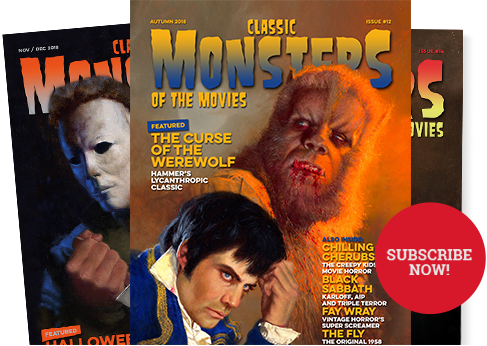 Subscribe now and never miss a single issue - Just £42 for 6 bi-monthly issues! 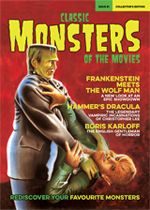 Classic Monsters of the Movies magazine brings something very special into the world of avid horror film fans around the world. 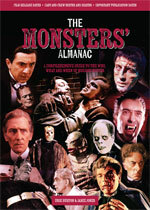 Inspired by the classic horror movie mags of yesteryear, especially the ones we all devoured as kids, it will deliver a bi-monthly catalogue of your favourite classic monsters, from The Alligator People to the Zombies, with a good unhealthy dose of Dracula, Frankenstein, the Mummy, the Wolf Man, Dr Jekyll and Mr Hyde, the Phantom, the Creature from the Black Lagoon and a whole host of others resurrected from the dusty crypt of our gruesome graveyard. 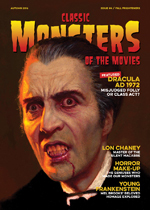 Each monsterthon of an issue is packed to the Gill Man with articles and features about all the great classic horror movies you adore, complete with rare stills, posters, facts and anecdotes from the cast and crew of the day. 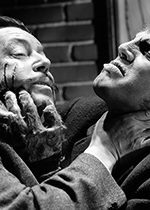 You’ll see all the old familiar fiendish faces, but in a line-up that’s as fresh as a crisp cadaver, bringing all the monstrous mayhem of yesterday right into the twenty-first century. 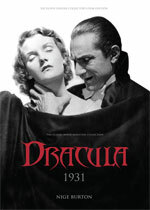 Don’t miss a minute of the ghoulish goings-on! 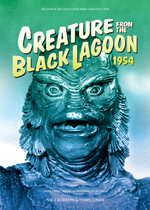 Order your copy directly from here or, better still, take out an annual subscription, and get our creepy chronicle delivered to your doorstep every other month - you’ll save money too! 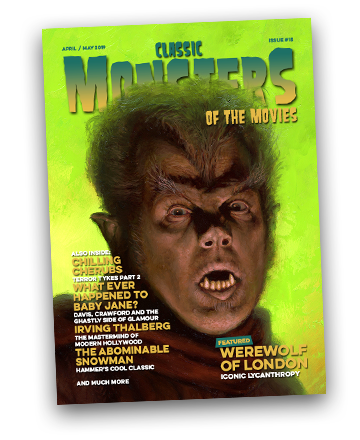 Classic monsters are back for good - with Classic Monsters of the Movies magazine, you get to re-live all the nostalgic nightmares from the heyday of horror, harking back to the days when vampire bats had strings and even a man who was pure in heart ought to have a perilous fear of yak hair. 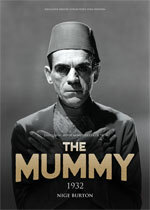 So, why not join Dr Pretorius in his toast: to a new world of gods and monsters!